In the year under review, the Ramakrishna Mission and Ramakrishna Math had the following medical and allied units. Specialised Medical Treatments: The following special treatments were provided by some of our centres through their hospitals, dispensaries, special programmes, camps, etc. Eye treatment was rendered by our centres at Belagavi, Bhopal, Garbeta, Kamarpukur, Patna, Porbandar, Rajkot, Halasuru, and so on, and at the hospitals in Lucknow, Muzaffarpur, Vrindaban, etc. Besides, many centres have separate eye-department attached to their dispensaries. Leprosy case detection and treatment was done by Headquarters (Belur Math) and our centres at Chennai (Math), Kamarpukur, Lucknow, etc. Maternity and child welfare services were provided by our hospitals in Kolkata (Seva Pratishthan), Lucknow, Thiruvananthapuram and Vrindaban and also by some dispensaries. Neurology department functioned at the hospitals in Itanagar, Kolkata (Seva Pratishthan), Lucknow, Varanasi, etc. Physiotherapy treatment was provided by Headquarters (Belur Math) and our centres at New Delhi, Indore, Itanagar, Kolkata (Seva Pratishthan), Lucknow, Nagpur, Shillong, Varanasi, etc. The centres at Rajkot and Visakhapatnam have special clinics for providing physiotherapy treatment to cerebral palsied children. Psychiatry treatment was provided in our Thiruvananthapuram, Kolkata (Seva Pratishthan), Vrindaban and Lucknow hospitals and also by some dispensaries. Tuberculosis cases were treated at the 150-bed sanatorium in Ranchi, the TB Clinic attached to Delhi centre as also by Headquarters (Belur Math) and our centres at Chennai (Math), Ichapur, Kamarpukur, Lucknow, Narainpur, Patna, etc. Besides, many centres had special departments for dental surgery, ENT, cardiology, pediatrics, acupressure, acupuncture, etc. Many centres provided ayurvedic treatment also. Medical Camps: In the eye camps, 14,435 patients were operated on for cataract and 5294 of them were given spectacles free of all charges. In other medical camps like Dental, ENT, Cardio-diabetic, Skin etc, 2,13,657 patients were treated. Under child eye care programme, camps were conducted in 66 schools, 62,216 students were examined and 4079 students were given free spectacles. Besides, 1398 units of blood were collected from 1578 voluntary blood donors through 27 blood donation camps. The total expenditure incurred for medical work in 2015-16 was Rs. 214.85 crore. Agartala centre conducted Mobile Medical Outreach camps under NUHM in the slums of Agartala Municipal Corporation. In Asansol centre AGFA Digital X-ray Machine was installed. Delhi centre added: Biochemistry analyzer (Transasia – EM 200), Optical Coherence Tomography (OCT) machine, Orthopantomography (OPG) machine. Itanagar centre added the following: Eleven B20 monitors in Pediatric /Neo-natal department, Blood Component separation unit, SOVEREIGN® Compact Phaco, FFA unit, Optical Coherence Tomography (OCT) machine, Nidek Green LASER, Maestro Plus 100 Diathermy machine, Medical oxygen & Vacuum System for 260 beds, 3 dialysis machines, AIRSEP O2 concentrator, and 30 kW Solar PV Power plant. Jayrambati centre added the following: Color Doppler USG, Digital X-Ray machine, medical van, Eye refraction unit with Slit Lamp, Electric Dental Chair, 3-way ECG machine. Telemedicine facility at Lucknow hospital was declared open. Narainpur centre added: Blood donor chair, CR X-Ray Machine, Cardiac Monitor, Automated Analyzers, Dental Chair, O2 Concentrator, Autoclave, Coulometer. Salem centre added urine analyzer and digital X-Ray machine. Sargachhi centre started conducting Homoeopathy Medical Camps. Constructed a six-storey diagnostic & cardiac care centre building with Catheterization Laboratory, CCU, HDU, CTVS-ITU. In ICU, 20 beds were refurbished & ICU equipment were modernized. Coronary Angiography, Coronary Angioplasty, Single & Double Chamber Pacemaker implantation, Bypass Surgery (CABG), ASD Closure, Mitral & Aortic Valve Replacement & Double Valve Replacement surgeries were performed in the newly added Cardiothoracic & Vascular Surgery Unit. The following equipment were added to Laboratory: Leica Immunostainer, Sakura Automated Slide Stainer, Tissue Tek DRS 200, Beckman Coulter Image 800 Immunochemistry System, Terumo Penpol Trima Accel for Plasmapheresis, Terumo Penpol Cryoprecipitate (-4°C) and Thermo Deep Freezer (-20°C), Thermo CO2 Incubator. Logiq F6 color Doppler system, Agfa DX D 600 DR system and Wipro GE Portable X-Ray were added to Radio Diagnosis Department. ‘Emergency Trauma Care Life Support’ course was introduced. Varanasi Home of Service added the following: Tonometers, Eye Refraction Unit, Slit Lamp, Endoscopy Machine, an Auto Analyzer in Lab, Neuro Instruments for OT, H.T. Trafo Assembly for X-Ray, a Syringe Infusion Pump and Multiparameter Monitors. 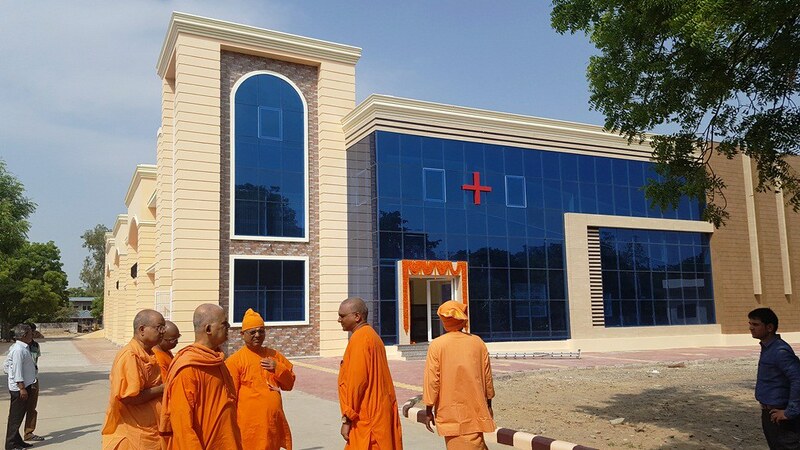 Ghatshila Math constructed a dispensary building. The newly constructed dispensary building at Gourhati Math was declared open. A homeopathic dispensary was started at Puri Math. Pune Math added to its dispensary (a) two units of Apex locator to facilitate Root Canal treatment of dental patients, and (b) a Pachymeter to the ophthalmic department. Rajkot centre added a Green YAG Laser, a Fundus Camera, an OCT Machine and a B-Scan machine to its Vivekananda Eye Care Centre. Ponnampet centre added a Laser therapy equipment to its Naturopathy unit and a Semi-auto Analyzer to its hospital. A Phaco machine, an Operating Microscope, an Operation Table and cataract surgery instruments to ophthalmic operation theatre. A neo-natal nursery with four phototherapy machines and two baby warmers to the maternity department. A Panchakarma centre & Kalari, a traditional form of treatment to the Ayurveda department. A counselling centre for teenagers, free regular classes on mindfulness and yoga (for psychiatric patients) to the psychiatry department.